This tour combines Grand Canyon highlights into one activity-packed day—and includes some free time at the West Rim. This Grand Canyon experience begins with a hotel pickup in a luxurious stretch limousine, with transportation to the pre-flight lounge. After boarding a helicopter, enjoy music, narration, and pilot commentary with the sight of major landmarks and historical points of interest along the way. The 45-minute flight passes over Hoover Dam, a modern marvel of engineering; the beautiful mountain and sandscapes of the Mojave Desert; the aqua waters and sandstone shorelines of Lake Mead; and finally along the winding path of the mighty Colorado River and into the incredible landscape of the Grand Canyon, one of the seven natural wonders of the world. While hovering high above the canyon, swoop down between its walls and land on the canyon floor. Walk around, get an up-close look at the many layers of the interior of the canyon, and gain an even greater appreciation of the immensity of this natural wonder. Additionally, enjoy a 15-minute pontoon boat ride along the Colorado River, looking up at the canyon’s many beautiful colors and stunning rock formations. 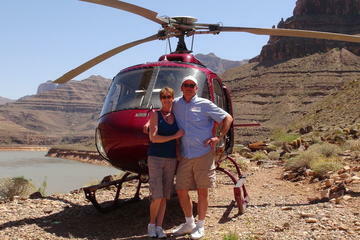 Then the helicopter will lift off and land at Eagle Point for time to explore at the top of the canyon's West Rim. Visit the Eagle Point Indian Village, learning about Native American history and culture. Meet members of the Hualapai Tribe, and discover their storied past as residents of the Grand Canyon. Then enjoy a Hualapai Indian buffet lunch, served at Guano Point overlooking the Colorado River. As an additional option, experience the breathtaking view from the Grand Canyon Skywalk, a glass walkway nearly 4,000 feet (1,219 meters) above the floor of the canyon. On the return trip, enjoy more of the sights and sounds from the sky, including the beautiful Las Vegas strip, before a final limousine hotel drop-off. There is a maximum capacity of six people per helicopter, plus the pilot. The pontoon boat tour may be cancelled due to high water levels in the Colorado River. In the case of a cancellation, extra time at the base of the canyon will be offered or a partial refund will be issued. What a wonderful trip and perfect weather. Totally worth it and the views will be remembered for a lifetime! This wonder of the world will not disappoint. Oour pilot Rafael was simply amazing, his knowledge, kind and patient demeanor made us all feel safe at all times. What’s more, he keep us entertained and engaged with his canyon fun facts and his overall happy demeanor. I think is one of those elite pilots that should be reserved at a premium. What a wonderful time we had with Sundance Helicopters, who would of thought snow could of been a problem this February. They had to delay our trip due to the snowfall, but both Viator and Sundance kept us updated and offered assistance in getting us a different flight. It was certainly an amazing way to spend my 50th birthday. Our pilot Erik, and his colleague Russ, had a lot to deal with as the snow had blocked many areas and we couldn't complete the whole tour we had booked, but they did us proud and made my birthday very special, cant thank them both enough for everything they did for us. The trip was absolutely amazing. Our pilot Chris was a very professional, fun, and informative at the same time. He also has a great music play list for your flight too. A must do in vegas for sure. Absolute amazing tour! Would recommend this to everybody that comes to Vegas! Our pilot Eric was fantastic and provided additional comedic relief to the predetermined audio tour that played over the headsets. This is a must tour if you want to see the Grand Canyon from the air, from the bottom and from noted view points all in one trip! The your way exceeded our expectations! It was expensive, for sure, but it’s the ultimate tour! It was a gorgeous day, and our pilots in the air and captain on the water were wonderful. It was the best way to see the sights and we couldn't have asked for a better experience. We highly recommend Sundance Helicopters. Was a really inspiring trip. Helicopter ride was smooth with informative commentary of the landmarks and history. Take the all day excursion. If you have one day, this is the one to do. Combines multiple experiences. Byron, our pilot was excellent at keeping people at ease and getting us through the safety steps. Smiling, friendly, gentle. Smooth flying and impeccable views. You will want to do it again, especially the helicopter.